We just moved to North Georgia at the end of December. We had been coming up for day and weekend trips for over 15 years, but when we decided to move, we found ourselves doing a ton of research about the different areas and cities in North Georgia. Some of it was with good old Google. Others was while we were driving around in a car with a real estate agent hoping to strike gold. Inadvertently we came across a handful of interesting facts that we didn’t know about North Georgia. Naturally we memorized most of these facts as a way to justify our moving from the “big city” to the middle of the mountains to our family and friends who thought we were crazy. We decided to put some of these down in the hopes that some of you might find them interesting. So without further ado, here are 24 Facts about North Georgia that we didn’t know before. We are also sure we’re missing out on dozens more! So please leave a comment and share any facts, trivia or knowledge you have about your part of North Georgia. We’d love to hear from you and get it added to the list. 1. The Blue Ridge Mountains are over 1 billion years old and are among the oldest mountain ranges in the United States. 2. The Cherokee who lived in the mountains called them “The Great Blue Hills of God”. 3. Brasstown Bald is the highest point in Georgia at 4,784 feet (read our profile of Brasstown). 4. Brasstown Bald, below the northeast peak, is home to Georgia’s only “cloud forest”, where the area is continually soaked from the moisture of the clouds. 5. Brasstown Bald is also the best spot in Georgia for astral photographers and astronomers as it has the least amount of “atmospheric turbulence” in the entire state. 6. The Appalachian Trail begins in Georgia at Springer Mountain. 7. But only 78 of the 2168 miles of the Appalachian Trail are in North Georgia. 8. Amicalola Falls is the tallest waterfall east of the Mississippi. 9. The biggest battle of the Civil War in the state of Georgia was at Kennesaw Mountain. 10. Dahlonega was the site of the country’s first major gold rush. 11. The town even had a U.S. mint that produced gold coins with the “D” mark until 1861. 12. Berry College in Rome has the world’s largest college campus, consisting of more than 27,000 acres of fields, forests, and mountains. 13. A majority of the movie Remember The Titans was shot on the campus of Berry College. 14. Marshall Forest in Rome is the only natural forest found within a city’s limits in the United States. 15. The only county in Georgia named after a woman is Hart county, named for Nancy Hart. Nancy was a patriot in the fight against the British during the Revolutionary War. 16. Hernando de Soto was the first European to explore Georgia in 1540. 17. All the major lakes in North Georgia are man made and used for power. 18. Dawsonville was was once home to the largest kangaroo herd outside of Australia. The Kangaroo Conservation Center closed in 2010 and the entire herd was shipped off to zoos and other animal facilities around the world. 19. Georgia has seven official natural wonders. The Seven Natural Wonders of Georgia are: Amicalola Falls, the Okefenokee Swamp, Providence Canyon, Radium Springs, Stone Mountain, Tallulah Gorge and Warm Springs. 20. The Georgia Guidestones in Elbert County is one of the weirdest things in the country. This granite monument with a set of guidelines engraved in multiple languages is oftentimes called the “American Stonehenge” and was built anonymously in 1979 by a mysterious person using the pseudonym R. C. Christian. 21. Gainesville is “the Poultry Capital of the World”. 22. Oddly enough, it is officially illegal to eat chicken with a fork in Gainesville. 23. Rabun County is basically a rain forest as it is the rainiest county in Georgia and one of the rainiest counties east of the Mississippi. 24. Approximately, 60% of the land in Rabun County is in National Forests and State Parks. What did we leave off? 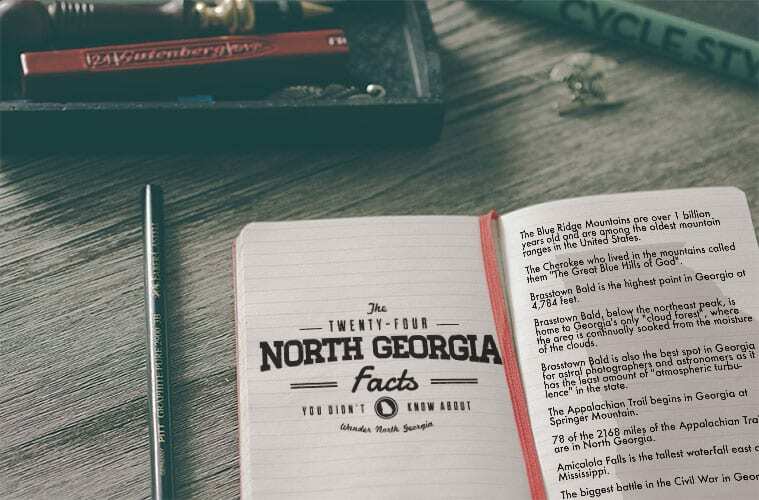 We know we’re missing out on a ton of other great facts and insights about North Georgia. Let us know what is unique and interesting about your city or region and be sure to leave a comment below to let us know what we missed and we’ll get it added in to the list above!